Datation : 4th millenium B.C. Categories: Animals, Sculpture. 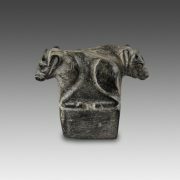 Tag: Statuette of an Elephant. While modeled in a simple and somewhat naive way, the body of the animal still attracts the eye of the modern viewer. 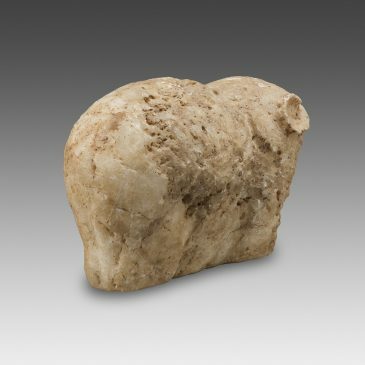 It was shaped as a cube and not hollowed between the legs, but the well-rounded posterior part clearly depicts the buttocks of an elephant. The opposite end shows more details, which enables us to confidently identify the animal represented here: the eyes (completely pierced), the trunk, the ears and the tusks of the pachyderm are accurately rendered, though in a slightly unrealistic manner. Elephants are known to have existed in Asia and Africa, but elephant bones were also excavated in Near Eastern sites (from the Levant to modern-day Iran): according to some scholars, the existence of a local species would even be possible. 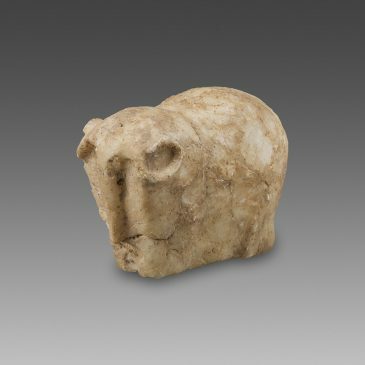 Other stone statuettes, especially a very similar figurine housed in the N. Asfar collection, confirm the hypothesis that elephants were present in Mesopotamia during the Neolithic and the Bronze Age (perhaps did they simply arouse curiosity). 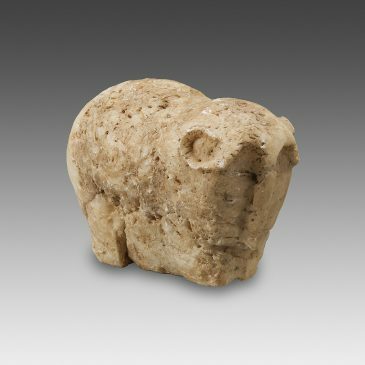 Furthermore, the Sumerian language included a specific word to define this animal: making a reference to its trunk and to its ability to drag heavy loads, the elephant was referred to as the “ox with hand”. Complete and in good condition, but partially reglued. Minor cracks and gap-fills, superficial wear on the surface. 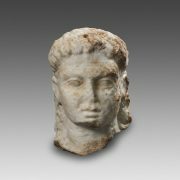 This head was virtually carved in the round, but would have been inserted into a relief or a wall, as suggested by the rough rendering of the upper and, especially, the posterior part of the skull. 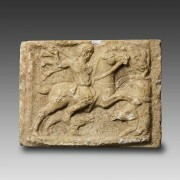 Roman Marble Relief representing the “Thracian Horseman”. The detailed image shows a horse mounted by a young hunter who hits a boar with his spear.